When the OSM were announced, we wanted to interview the men behind it. The Horsemen, Mel Birnkrant, & Matt Doughty all agreed to talk with IAT, but our schedule conflicted with that of Onell Design’s Matt Doughty. We’ve finally corralled him and are happy to bring you his thoughts on the OSM. 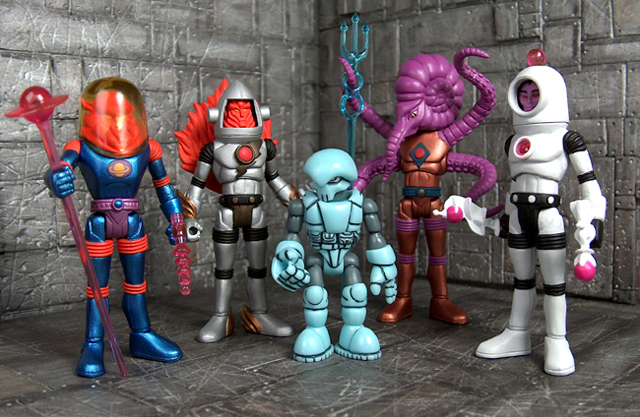 At IAT, we’re big fans of Onell Design and their Glyos line, so we were particularly excited to hear that the Four Horsemen would be working with Matt on the Outer Space Men. We wanted to know more, if he had any prior experiences with the OSM, what his role was in the line, and his thoughts on their future. IAT: Having figures from the original Outer Space Men and/or the Colorforms Space Warriors set in their youth appears to have been a huge influence in pushing some of the Four Horsemen to develop an interest in the Outer Space Men. Were you familiar with the property before collaborating with the 4H on it? Matt Doughty: The Outer Space Men have been floating around in my minuscule brain since I first came across a battle ravaged Colossus Rex that belonged to my uncle when I was around 4 years old. I discovered that worn out reptilian lurking at the bottom of a red metal bucket my Grandparents kept some older toys in at their house. It was also filled with green army men and assorted dinosaurs. I had never seen such a nasty toy and fell instantly in love. The thing was, I could never take him back home, he was a Grandparent’s house specific toy. That fact used to drive me crazy (it still does). I played with Rex for years, never knowing his name or his origin, I just called him Dinos. Eventually he just vanished in some horrible “cleaning” accident (my wife still has them). It was only in the early 90’s that I found out the series Rex was from and learned more about the original line. Working on the new OSM project makes my inner 4 year old crazy with happiness. IAT: Both the Four Horsemen and Mel have talked about their roles in bringing the Outer Space Men back. What has been your role in their reintroduction and handling of the new line? MD: As far a my role in the OSM project, it’s mainly just making sure everything goes smoothly at our factory. Checking the right colors, durometer, fit functions and the technical aspects of the production. The Four Horsemen are brilliant and bring so much experience to the table. We have developed a solid system of getting the figures made together, combining all the strange bits of knowledge we each possess. I love working with those four crazy guys, we have some fun talks about toys just in general. I’ve yet to meet Mel, but his work has influenced me in so many ways and I’m very thankful he paved the way creatively for so many generations of toy makers. His genius is finally getting the credit it deserves. I believe the Horsemen are truly his successors, a natural fit to carry the OSM into current times. I’m absolutely psyched to be involved. IAT: The standard question for these interviews has been to ask about favorites. 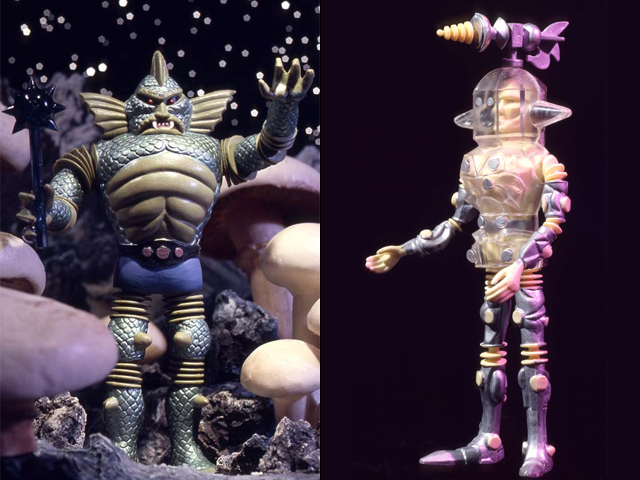 Which of the Outer Space Men are you most looking forward to seeing redone in the new line? MD: Well, I really love them all, but I’d have to go with Colossus Rex… and yes I will call him Dinos. Gamma -X is also a must have, as I’m a huge fan of glow and clear combined. IAT: The 4H have said that one of the reasons the 1:18 scale was chosen for the new Outer Space Men was because that scale would work nicely with the Glyos system. Since the OSM are larger than most of the Glyos, could you tell us a little bit about how you see the OSM fitting into the framework you’ve already built? MD: Scale is a funny thing, so many collectors get very serious about consistent true scale (I’m one of them). I’ve always seen the Glyos System as a smaller line, with Pheyden being about 6 feet and a bit tall. He is able to change his size, so sometimes he may be smaller than that or other times much larger. The idea of scale makes me crazy as well because originally I had made Pheyden quite a bit larger in Rechlen and Aves (the old hand cast figure line we used to do). The main figures from that line were 1- 3/4″ tall and they were supposed to be just under 6 feet tall, so Pheyden was a freaking giant in that original toy line. I like the idea that most of the Glyos guys are shorter in comparison to the new OSM. It just seems to work for me, mainly because of the slight super deformed look that most of our stuff has. Just a touch of kid toy juice. The sculpts on the new OSM are beautiful and are much more technically structured like a classic action figure. Like super charged Adventure People (my favorite toy line) with the OSM aesthetic that are also interchangeable. The taller frames allow for some cool options when OSM and Glyos are combined. On a funny side note, since I have Adventure People on the mind, I wanted to explain why Pheyden has one fist and one open hand. It is in paying homage to Adventure People and their old bent elbow/pointing finger positioning on one arm. For some reason I loved how that looked and wanted Pheyden (and all the other clowns) to have that specific vibe, which I think only I seem to get! IAT: Part of the appeal of Glyos is the ability to easily personalize the figures. With the Outer Space Men, the Glyos system is getting applied to licensed characters for the first time and bringing personalization to that license. We find the notion that we can easily customize and create new characters for an existing license intriguing. What role do you think this type of personalization could play in the future of toy collecting? MD: In a perfect toy universe I would like to think that every toy line could combine in some way. Imagine if all the big companies and little companies used the same system of construction for at least one of their toy lines. I would love to pop an OSM figure apart and combine it with a Clone Trooper and then top it off with some Batman parts, sprinkled with a touch of Ben 10 pieces. It could be a secret agenda, that nobody really talked about in the open but everybody knew was happening because of the legal minefield it would be built on. I like systems that are user friendly first. If the system truly works, then you can dress it up however you see fit, but the fundamentals have to be very sound. Glyos is fun because the user is in control of how it looks in the end, even if the figure starts out as something else, because the core system is consistent. I’ve said this before, but we sell paintbrushes more than paintings. Customization within specific systems seems to be the future, of more than just toys. MD: Future plans for Glyos include expanding the figure selection and making more accessories to tinker with. We have more Custom Corps (custom versions of Glyos figures) crossovers on the horizon as well. Some more RealXHead team ups and hopefully just general evolution of the whole Onell thing. We’re just lucky to be here, doing something fun together with awesome people. A special thanks to Matt Doughty for taking time to talk with us and for the awesome pics! Those are some awesome creations using the OSM pieces. I was lucky to get my one set of the Alphas though and now I wish I could afford extras to build stuff! Maybe this isn’t the right place to do this, Matt, but it’s surely the right time. Why do I feel we met already, maybe in a former lifetime, or on the astral plane? 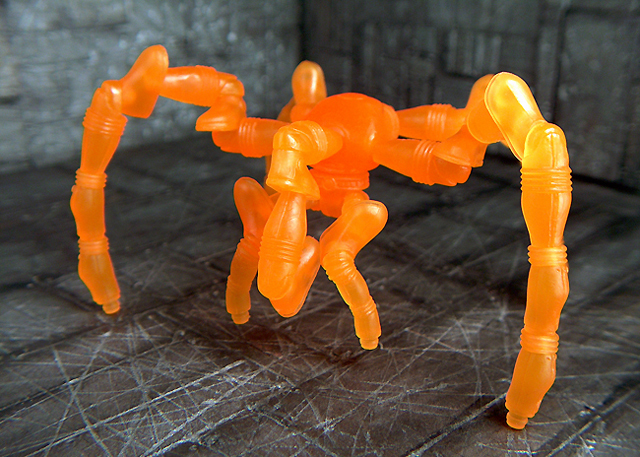 Anyway, I’ve got to say, your OSM GLYOS creations have just blown me away! Especially, the Astro Nautilus creature at the bottom of the page, a Lovecraftian Abomination that puts Cthulhu to shame. There is a current expression that I never fully understood. You just enlightened me. For the first time, I think I see what “Thinking Outside the Box” really means. PS. 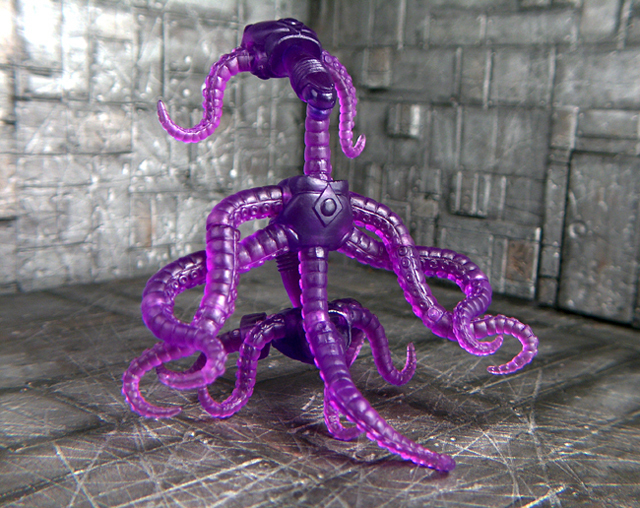 There ought be a “Tentacle Accessory Pack”, “Bag-O-Tentacles”. Tentacles in every color of the rainbow! Tentacles are the new Lego! “Bag-O-Tentacles” in all different colors (solids, translucents, metallics, etc) would be fantastic!!! the minds working on this new incarnation of the OSM are truly six of a kind, and i love to see whimsy getting brought back to toys… it’s certainly not popping up anywhere else. the only thing we’re missing now… vehicles. vehicles w/ swapping parts so the figures can literaly merge w/ the vehicle rather than just drive it. i know, “in a perfect world, with an unlimited budget…” but hey, we’re inspiring dreams here, right? Great interview and some amazing creations by Matt! I wish I had the extras of the OSM to build that stuff! Fanastic interview! Matt seems like an awesome guy!